I am not one of those bloggers that writes months of post in advance, I am not even one that writes their posts weeks in advance. In fact I decided upon this recipe just last night. I wish I could be one of those bloggers that have everything done in advance, but right now life is busy and I do have a tendency to be a procrastinator to a point. But then again sometime it is okay to be a bit of a procrastinator, take this recipe that I found last night. If I would not have been looking for a recipe last night to make tonight I may have never found this easy delicious meal… and that would be quite a shame. 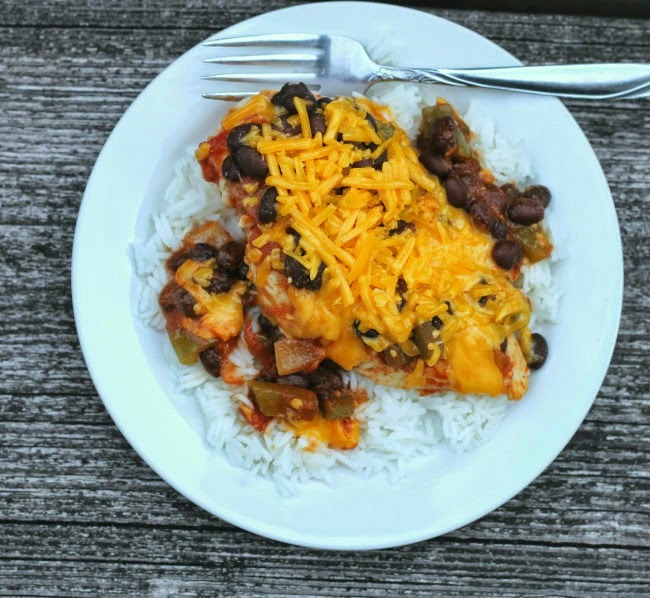 This chicken skillet was on the table in about 30 minutes and the chicken is smothered in salsa, black beans, and cheddar cheese; I decided to serve it over rice. It is one of those perfect meals that you can enjoy in the middle of the week. 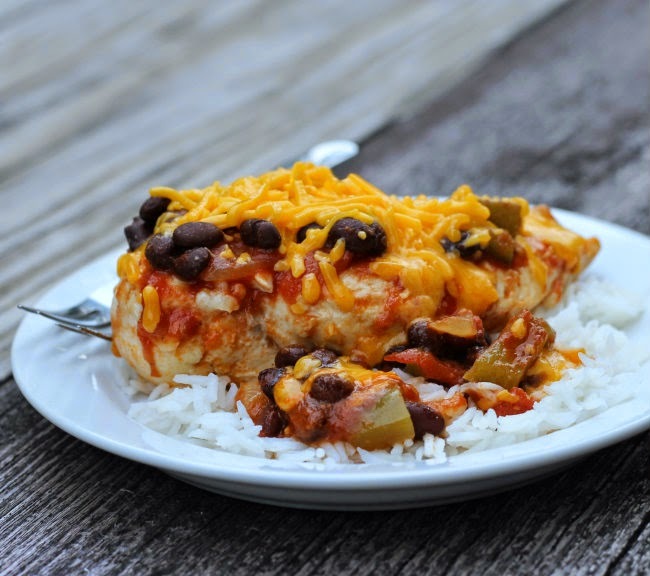 If you decided that you don’t want to dirty another pan for the rice, this could easily be served with tortilla chips and it turns into a one skillet meal. No matter what you serve it with or without it is a go to meal for the middle of the week or the weekend meals. I made it with two chicken breast, but there is plenty of sauce that you could make it with four for a larger family. You say you don’t like chicken breast… you can use chicken thighs. Change it up to what you like. 1. In a skillet heat about a tablespoon of olive oil over medium high-heat. Place the chicken breast in the skillet and brown the chicken on both sides. 2. Once the chicken is brown add the salsa and the black beans that have been rinsed. Bring to a boil; reduce heat to medium and cover. Cook chicken until it is no longer pink in side (165 degree F) about 10 to 12 minutes. 3. Remove from heat and top with cheddar cheese. Cover for about 5 minutes or until the cheese is melted. 4. Serve over rice or with tortilla chips. 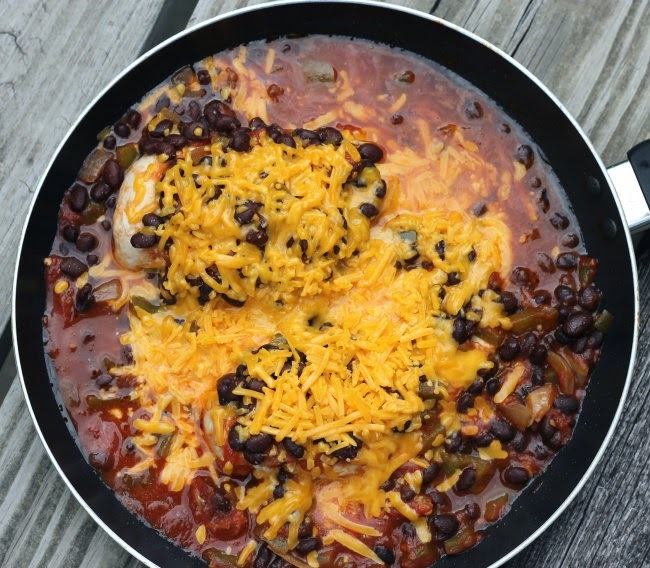 Dawn, I love the look of this skillet…packed with flavors…yum!